The Eastern culture is no longer unattainable to Western countries as we have access of all the resources of our Eastern history online that can easily attain by anyone. Although the internet has closer the gap between two different cultures, it is not hard to see how fascinated are the Westerns towards Eastern's thousands year of culture, especially in the world of fashion. Fashion is one of the main portal of culture and idea exchange, you can see that Eastern culture has established its important role at modern fashion trend which can be trace from all sorts of fashion-media platform, from magazines to exhibitions, fashion weeks to celebrity style, there are Eastern-culture influence everywhere. Western had their eye on Eastern influence and have drawn "inspiration" from exotic Eastern culture since the 17th century, projecting to the world how Eastern culture blend in so well with modern Western design, created something modern and yet exotic, something new and yet has its traditional touch. It fascinates me so much to see how European designers manage to blend in two different cultures into one dress. A Chinese myself, it gives me goosebumps to see how pretty it is the traditional Chinese motifs make its way to high fashion labels of Europe, looking so fantasy and yet classy at the same time. Look at these glorious cultural hybrids style by celebrities. When Katy Perry held her concert at Japan, she had this Geisha look while performing, and that look suits her so well! On the other side, Rihanna's carrying an Asian-motif embroidery handbag by Saint Lauren, which the motif - an eagle on the branch in vivid colours, a distinctive accent immediately added into Rihanna's streetwear look. 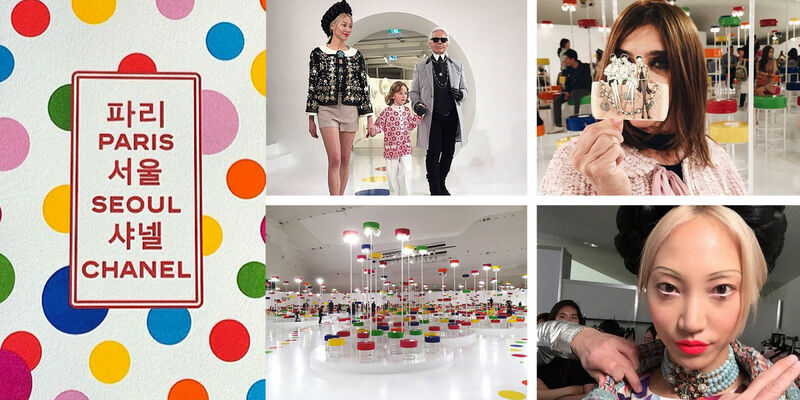 Everybody loves Chanel, and Chanel love Seoul because Chanel chose Seoul to held their Cruise Collection 2016 show. The Korean traditions offered Karl Lagerfeld inspiration this time round and also, the K-Pop phenomenon that nobody can neglect had filled the show with colours and sugar-rush that the designer could possibly crave for. Eastern culture influencing fashion industry has created a whirlwind when Chanel Cruise Collection 2016 chose an Eastern country to held its show, and also created a new trend for fashion-goers to follow. Like aforementioned, Eastern influenced on Western culture has started since seventeenth century, and can be traced all the way back to the silk trade between Asia and the Roman Empire. The Silk Road/Silk Route, is an ancient network of trade routes that connected the cultural connections between Asian regions and Western regions. The main traders during antiquity were Chinese, Persians, Somalis, Greeks, Romans, Syrians, Armenians, Indians, Arabs and Bactrians. The Silk Road served as a means of carrying cultural trade among the civilizations, which I believe created the whole idea of "East meet West" and form the cross-culture in fashion industry in modern days. In June 2014, Chang'an-Tianshan corridor of Silk Road is declared as World Heritage Site by UNESCO, establishing its special cultural significance in modern day culture.